It comes with cute TV appearance, nice package, and crystal clear sound quality, which can be a perfect gift for the Birthday of your friends and families, or New Year, Valentine's Day, Christmas, Thanksgiving Day! The Cute TV Shape, smooth surface, elegant looks and natural beauty also make it a perfect item for decoration. Only 2.8*2.8*1.5 inch, 3.3oz, cool and unique wireless bluetooth speaker, small but loud and offers crystal clear sound. With Cute Mini TV Shape, this mini bluetooth speaker comes with smooth surface and built-in Microphone, solid built and tiny. This wireless speaker is easy to pair and use. Just one button for Play/Pause songs and Answer/Reject Phone calls. Volume, track selection and playback are all controlled by your Bluetooth device. The top of this small bluetooth speaker has a short Sling with which you can hang it up wherever you like, your backpack, the kitchen, laundry room, outside or in the car, Oh, even the Christmas trees. PERFECT GIFT FOR YOUR KIDS, YOUR FAMILIES, YOUR FRIENDS AND YOURSELF! Ready to rock with this amazing small speaker? 3-YEAR WARRANTY guaranteed, life time tech support, totally NO RISK order! "Add to Cart" now! 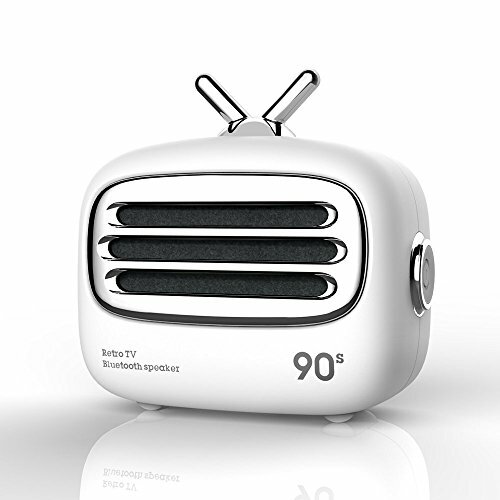 ELEGANT DESIGN: Through multiple designs, this mini Bluetooth speaker with elegant arcs and cute mini TV appearance redefines new fashion and aesthetics in mini speakers. Perfect choice for gift and decoration. HIGH VOLUME WITH SMALL SIZE: With a compact design, this portable Bluetooth speaker is super portable to carry with. The portable wireless speaker with 3W power driver and enhanced bass resonator offers crystal clear and incredible sound quality. WIDE COMPATIBILITY: Bluetooth connection could support iPhone, iPad, iPod, Samsung, Kindle, Android Phones, Tablets, Cars and ect. This portable speaker can be applied to family dinner, corporate party, friends gathering, drinking night, holiday trip - anything goes. FREE YOUR HANDS: No matter when you enjoy bathroom or outdoors time, the built-in MIC and hands-free function let you enjoy wonderful music without the hassle of long cable and set free your hands from answering a call. If you have any questions about this product by AVWOO, contact us by completing and submitting the form below. If you are looking for a specif part number, please include it with your message.